I hope you had a fantastic Halloween! 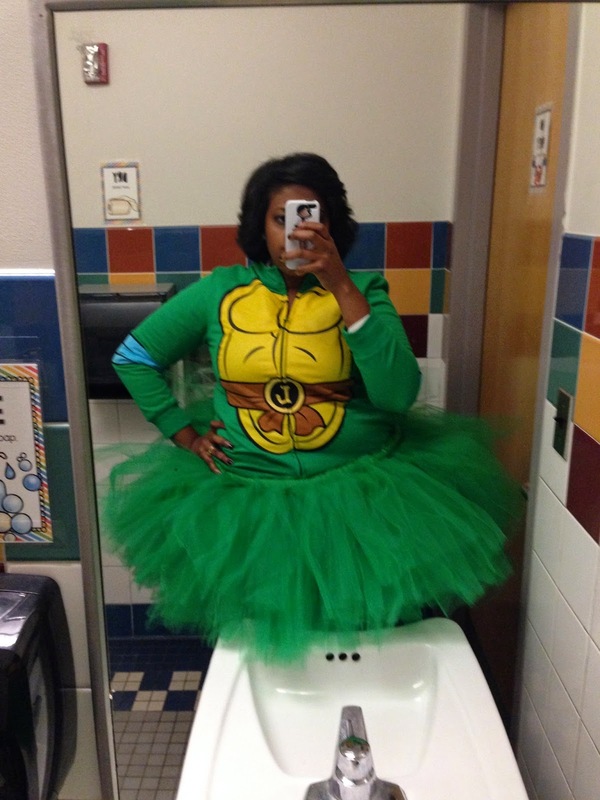 I wore a tutu (surprise) and dressed up like a ninja turtle. A lot of the kids were amazed that I was a Ninja Turtle...Girls can like superheros too!! A few weeks ago I was contacted by Creative Teaching Press about something really awesome. They are trying to raise awareness about men's health during the month of November. -please note that I was not about to talk to my littles about men's health. But, I knew I could use the mustaches in a purposeful way. 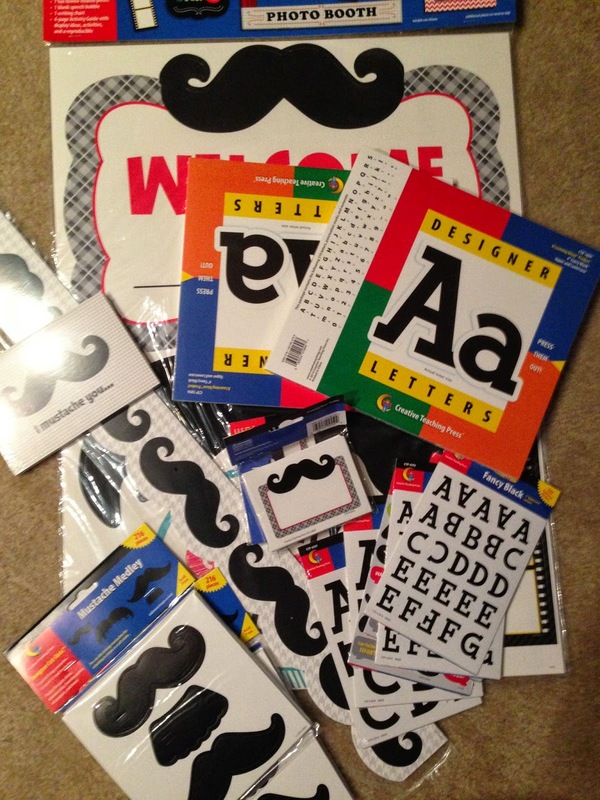 They wanted to see if teachers could help in their efforts by incorporating mustached themed items into their classroom or projects. I was so excited to get this amazing opportunity!! Here's what they sent me! 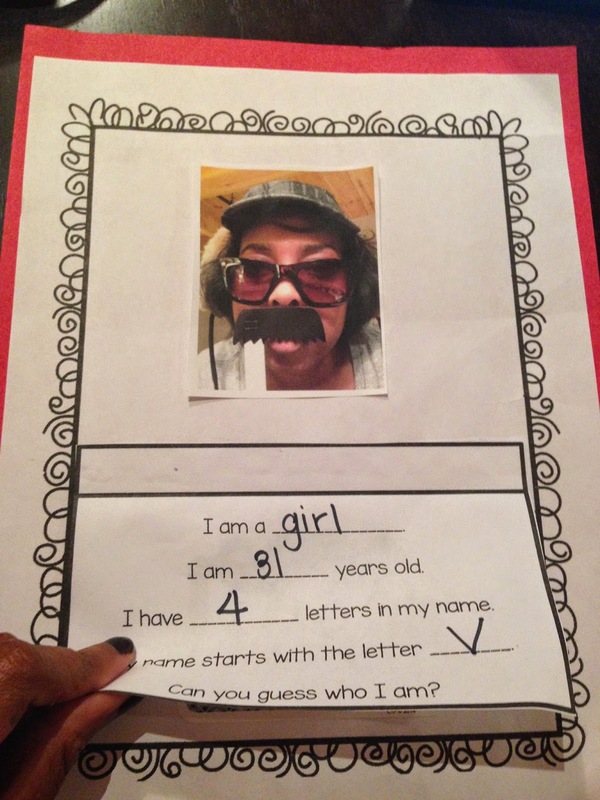 I thought the kids could use the mustaches to create a secret identity. 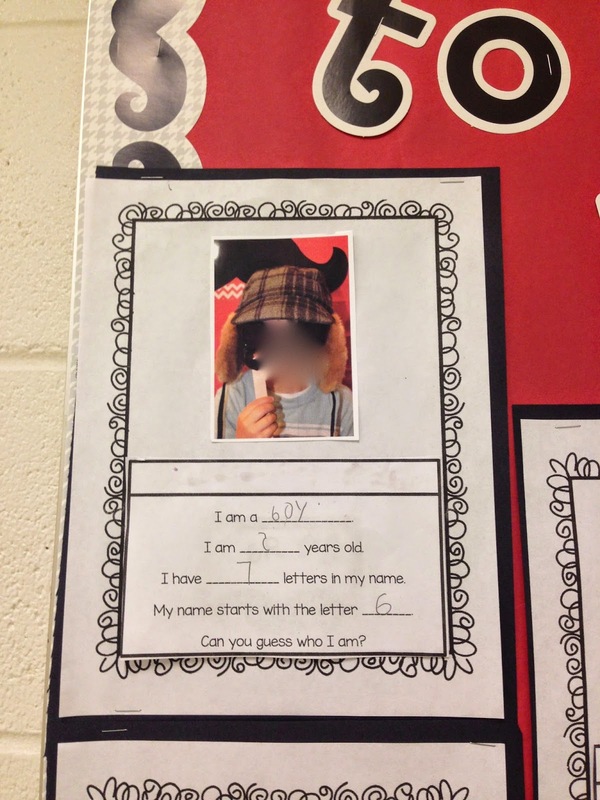 I'd bring in hats and sunglasses and the kids would have to write some clues about themselves so people could guess who was who. Let me tell you, with all these goodies I had more than enough to make it happen. Well you know what they say about good teaching: Model, model, model! Well, here I am modeling a potential mustache disguise for my kids. Then, I wrote some facts about myself. Glued the picture onto some fancy paper and Bam! The clues are written on a separate sheet of paper that is then glued to the fancy paper so that people can lift up the flap and see the name of the student underneath. We wrote our names on those fancy little mustache labels. My kids did a great job with their projects and I wanted to hang them in a place where people could interact with their work. There is a bulletin board in one of our main hallways that I "borrowed". I used the letters from Creative Teaching Press to title my bulletin board. It's so punny get ready. The funniest thing you'll read today. 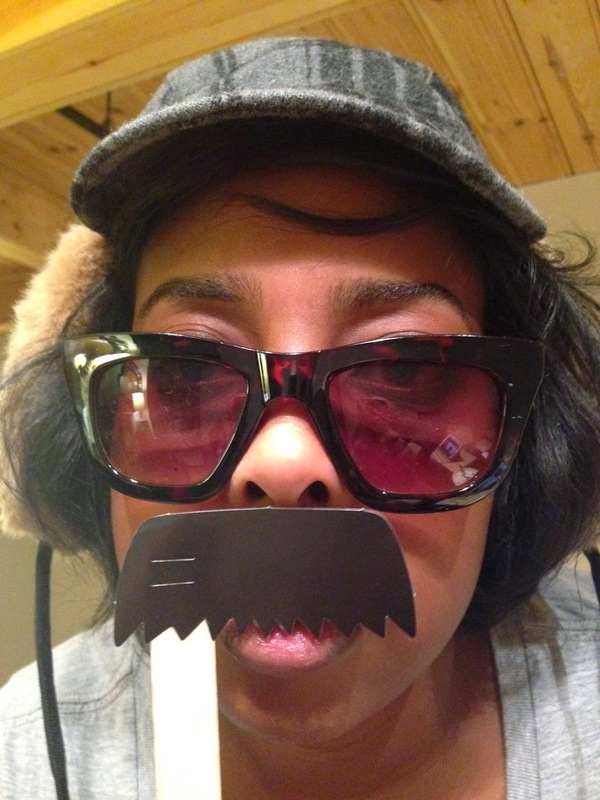 I "mustache" you to guess who I am! I'm sorry I had to blur out this little one's face especially since it was sooo cute in the disguise!! Here's a look at the entire board. My kids had a great time with this! And they are receiving compliments EVERYDAY about this board. 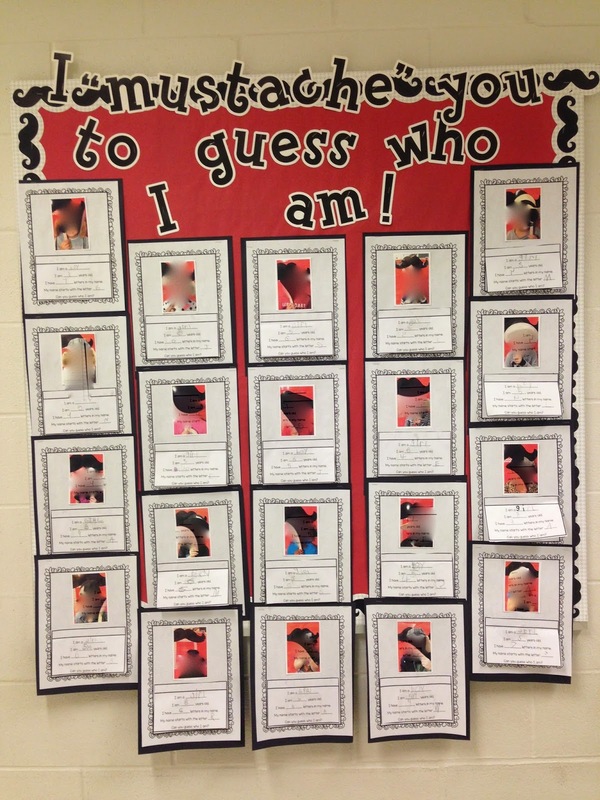 I love the interactive part of it and the kids loved choosing a disguise and taking home a mustache!